Îrfan Amîda was born in 1968 in Qesrê village of Mêrdîn (Mardin) Province. He graduated from the Department of History at Dicle University. In the year of 2014, he received a master’s degree from the Department of Kurdish Language and Culture at Mardin Artuklu University. Between 1991 and 1992, he worked at NÇM (Navenda Çanda Mezopotamya, orMesopotamia Culture Center) in the fields of the Kurdish culture and folklore. His early writings and poems were published in the magazine Rewşen at that time. He has published his poems in the Kurmanji dialect of Kurdish in his books Dîmenên Derizî (Cracked Views), Nameyên Nabersivin (Letters with No Reply), Şopa Neşûştî (The Tracks Left Behind) and Zaremya (Zaremya). Aside from his poetry, he has published a novel titled Pêşangeha Sûretan (The Exhibition of Semblances). In addition, Amîda has written for many websites as well as for the newspapers Azadiya Welat, Evrensel and Özgür Gündem. In most of his poems, Amîda draws the readers’ attention to the truth of his country and examines the sociological and political dimensions of his country. In this context, examples cited from history and folklore are frequently seen in his poems. However, these examples, for the most part, shine out stylistically. The paradoxical antagonism between the individual and the society also comes through in Amîda’s poems. His novel can also be evaluated in this regard. Amîda has lived in Mardin since 1994. 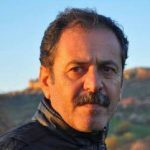 As a labourer, he has always been involved in the struggle of the working class and presided for a term over the Mardin Branch of the Education and Science Workers’ Union in Mardin.